Something I was thinking about the past couple days, especially after I decided to stop one of my other blogs and use its theme in this blog instead, was that my "Monday Catch-Up" post idea would likely be better suited to a Saturday. And use my theme for my Modern Go-Getter blog for a Monday post. It just made sense. Modern Go-Getter Monday. I just think it sounds nice. And what better way to open up the week with someone who has either proven herself/himself as a go-getter, or a quote that inspires us to that end? Personally, I'm excited about the idea. Especially since I have the perfect person to be featured in the first Modern Go-Getter Monday. Last year, intrigued by the hype I'd heard for years surrounding the Harry Potter books/movies, I decided to start reading them. I started late last year--and I just couldn't stop. Well, I haven't read the second book but that's just because for some reason it's never there at the library when I go to get it! 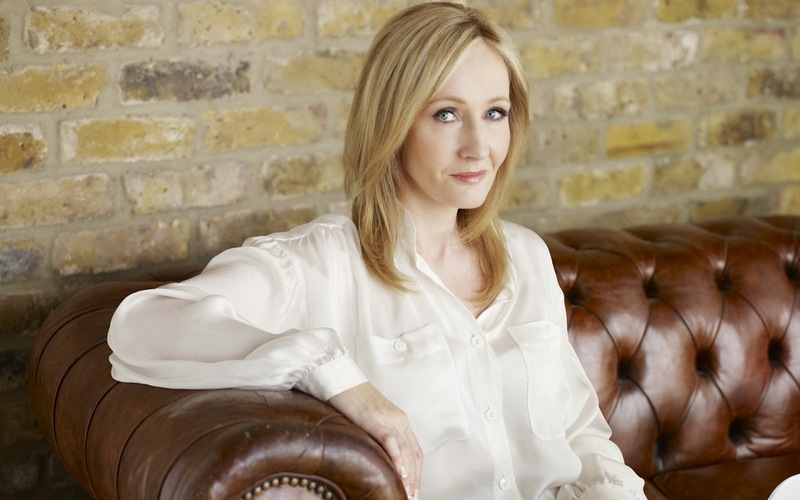 I've read all the other books, and watched the movies--and I immediately wanted to know more about J. K. Rowling. Who was the woman behind this story so full of friendship and devotion? I was able to find a short bio at the library on J. K. Rowling, and was surprised to read about how hard certain times of her life were--but in retrospect, perhaps it isn't a surprise at all. You can feel it in her books, it's part of what makes them so powerful. She truly understands certain things through experience. Reading about her struggles in her personal life, with marriage and then struggling to provide for her daughter, really got to me. Being a single mother is no joke--especially coming out of a bad relationship. Yet through it all, she holds on to her writing--she keeps persevering, even while she works hard at providing just the simplest things for her daughter Jessica and herself. And from what I can tell from what I've read and watched through interviews, Rowling seems like someone whose success hasn't really changed who they are--just what they're able to do. She seems like the sort of person you can imagine having for a neighbor, who just enjoys the privacy of her family, while she pursues the charity work she's passionate about, her new projects that she's dedicating herself to. One thing that came up often is her speech at Harvard, and her talking about being at rock bottom, and the valuable things you really can take from failure. That really struck a cord with me, because as anyone who knows me would attest, the thing I fear most is failure. At least, complete failure. Everything I touch, I want to make a success, although I've learned that there comes a time to walk away from something. Rowling has really inspired me--she doesn't make excuses. I can't wait to see what else she'll offer in the years to come. I have a gut feeling that I've other things to learn. Here is a link to the speech she gave at Harvard, which is much quoted, and for good reason. It's a call for all of us to have the guts to seek the best of things. "It is impossible to live without failing at something, unless you live so cautiously that you might has well not have lived at all, in which case you have failed by default."